On my mom’s birthday, I wanted to make her something special—especially because she is an intuitive cook with an extensive recipe collection. Usually for birthdays my family makes a Sour Cream Chocolate Cake from a cookbook entitled “Rosie’s All-Butter, Fresh Cream, Sugar-Packed, No-Holds-Barred Baking Book,” which, don’t get me wrong, is awesome. However, the cake is so rich that even a yearly indulgence risks artery-stoppage. 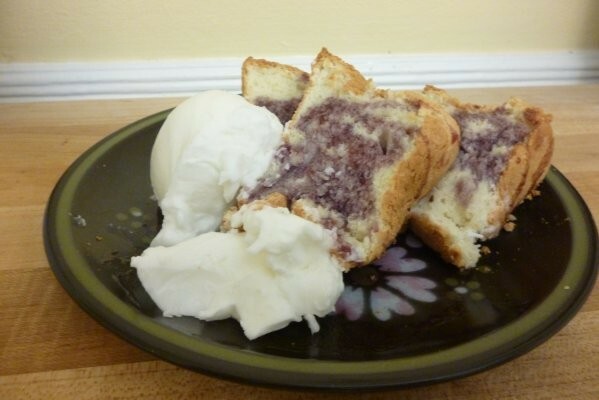 So I made this cake instead: an Angel Food Cake, as different as could be from our Sour Cream Chocolate standby. It is light, fluffy, and delicately flavored. The batter tastes like marshmallow taffy! Sarah Trautman writes for SKC from Carleton College in Minnesota. Her dining hall to-go favorites are house-made granola bars and self-made parfaits, stuffed into a coffee mug. Preheat the oven to 350°F. Thoroughly grease and flour a bundt cake pan (these are the best type because the cake will cook more evenly). Set aside. If you’re using a carton of egg whites, measure out the appropriate amount as written on the box. Otherwise, separate 12 eggs and put the whites into a large mixing bowl. Do this by cracking the egg cleanly and pulling the halves apart, keeping the yolk in one half of the eggshell. Let the egg white drip off of the side of the shell into the mixing bowl. Put the yolk aside—save for a pudding, or just throw it out. Beat the egg whites on high. When the mixture is frothy and forms soft peaks (when you lift at the whites, they form a peak that quickly droops), add the cream of tartar and beat again. Still beating, slowly add the sugar and the vanilla. Stop beating when the mixture forms stiff peaks when you pull a spoon out of it, or when a spoon dragged through it leaves a defined path. Fold the flour mixture into the egg white mixture in three parts: basically, cut the mixture in half with a spatula and lift it over onto the other half, and repeat until the flour is evenly mixed into the egg whites. Taste test! Put the batter into the pan, and bake for 35-50 minutes (depending on the oven). When the cake is done, it will be golden brown, a tester fork poked into it will come out clean, and the edges of the cake will pull away from the sides of the pan. This does sound fantastic! Now I need a pudding recipe! And definitely tasted like marshmallow taffy. I’ll give ya that one. We will give this a try soon. Family coming over in February. I plan to serve individual plates with a dollop of light whipped cream, a drizzle of hot chocolate, mixed fresh berries(mint to garnish), and finally, throw on a pinch pf pralines for crunch! My husbands birthday is the week and I can’t wait to try this recipe. It sounds lovely, and although I’ve never had angel food cake with blueberry syrup, peanut butter, or chocolate, I can’t wait to try.